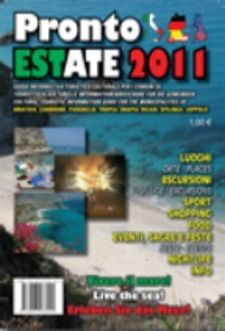 Pronto Estate 2011 is a trilingual guide, freely downloadable in pdf format at www.prontoestate.it. Pronto Estate 2011 is actually a cultural-touristic guide for the following municipalities in Southern Italy: Briatico, Zambrone, Parghelia, Tropea, Drapia, Ricadi, Spilinga, Joppolo. Here you will find the Italian audio of the guide, so that you can listen to it and improve your Italian as well if you are interested in the language. Reads Antonio Libertino, music by Kevin Macleod. Pronto Estate 2011 e una guida trilingue, scaricabile gratuitamente in formato pdf da www.prontoestate.it. Pronto Estate e una guida informativa turistico-culturale per i comuni di Briatico, Zambrone, Parghelia, Tropea, Drapia, Ricadi, Spilinga, Joppolo. Qui troverai l'audio in italiano della guida, da ascoltare anche per praticare il tuo italiano. Legge Antonio Libertino, musica di Kevin Macleod. We will send Pronto Estate 2011 to your Kindle at . Pronto Estate 2011 has been sent successfully to your Kindle!